The Barnhart Mercantile Co. was founded in St. Louis, Missouri, in 1875 by William Randolph Barnhart (1850-1920). This effusive description of the company appeared in The Industries of Saint Louis; her relations as a center of trade; manufacturing establishments and business houses, by John W. Leonard, St. Louis, Mo., J. M. Elstner & Co., 1887, "Barnhart Mercantile Company.--William R. Barnhart, President; C. L. Barnhart, Vice-President and Treasurer; H. P. Miller, Secretary; Wholesale Dealers in Fancy Groceries, Foreign and Domestic Fruits, etc. ; 413 North Second street.--The large establishment conducted by the Barnhart Mercantile Co. was founded in 1877 by Mr. William R. Barnhart, and was incorporated under its present name in 1883. The premises occupied by the company consist of a commodious five-story building, 40x150 feet, comprising No. 413 North Second street. They do a very large wholesale business in fancy groceries, of every description, to which branch of their trade they devote special attention, and are also large jobbers in foreign and domestic fruits, nuts and canned goods, making specialties of oranges, lemons, cranberries, peanuts, pecans, etc. They do an extensive business sending foreign nuts, cranberries, etc. to California, from whence they bring fruit; send nuts, sauer kraut, etc., to New Orleans, and do a large trade east to Indianapolis, and all west to California, and in all the territory north and south between these two points, enjoying a specially large patronage in the States of Missouri, Iowa, Minnesota and Kansas. The company employs five experienced travelling men to represent their business on the road, and have twenty competent assistants employed in their store. They have a complete plant of the most modern machinery and appliances for hand-picking and cleaning peanuts, which they handle in immense quantities. Few people have any adequate conception of the importance of the trade in peanuts, which are as staple as coffee, and an article of commerce in which transactions of great magnitude are carried on, and from which St. Louis receives much profit. The history of the house has been one of steady and continuous growth, and it has had a large share in the prosperity resulting from the general revival of business in 1886, while its outlook for the future is bright and promising. With every facility for advantageous transactions in its line of trade, and a high reputation for the uniform superiority of its goods, the spirit of fairness and liberality by which its dealings are ever characterized, and the absolute correctness of its business methods, this house enjoys, in an eminent degree, the esteem and confidence of the trade, and that high standing and assured success which legitimately results from manifest merit." William R. Barnhart was born 8 March 1850 in Streetsville, Canada, and died 12 December 1920 in University City, St. Louis County, Missouri. This account from The Book of St. Louisans; a biographical dictionary of leading living men of the city of St. Louis, edited by John W. Leonard (St. Louis, The St. Louis Republic, 1906), summarizes his early life, "Barnhart, William Randolph, president Barnhart Mercantile Co.; born Streetsville, Canada, Mar. 8 1850; son of Robert and Mary Susan (Randolph) Barnhart, (both natives of U. S.); moved with father to Weston, Mo., 1853; educated in public and private schools, Weston, Mo., until 18 years of age; married, St. Louis, Sept. 17, 1884, Fannie Greenwood Woodson; children, Woodson, William Randolph Jr., Nancy Elizabeth, Robert Everard, Fannie Carter, Mary Randolph. Clerk in drug store, Leavenworth, Kan., 1868-70; salesman and commercial traveler for wholesale grocery house, 1870-75; established business for self, 1875, in grocers' specialties and wholesale fancy groceries, and in 1883 incorporated the business as Barnhart Mercantile Co., of which has since been president. Also president Globe Realty Co., and director of Randolph Realty Co. Democrat. Methodist (Southern). Member Kentucky Society. Office: 518-520 N. 2d St. Residence: 4221 Delmar Boul." The following notice appeared in The Peanut Promoter, January, 1921, reporting Barnhart's death, "From a newspaper item The Peanut Promoter learns of the death of one of the oldest peanut men in the United States, William R. Barnhart, of St. Louis, Mo. He was chairman of the board of the Barnhart Mercantile Co., and up to about a year ago, was president of the company. Retiring from the active management of the company, he placed his son in charge. 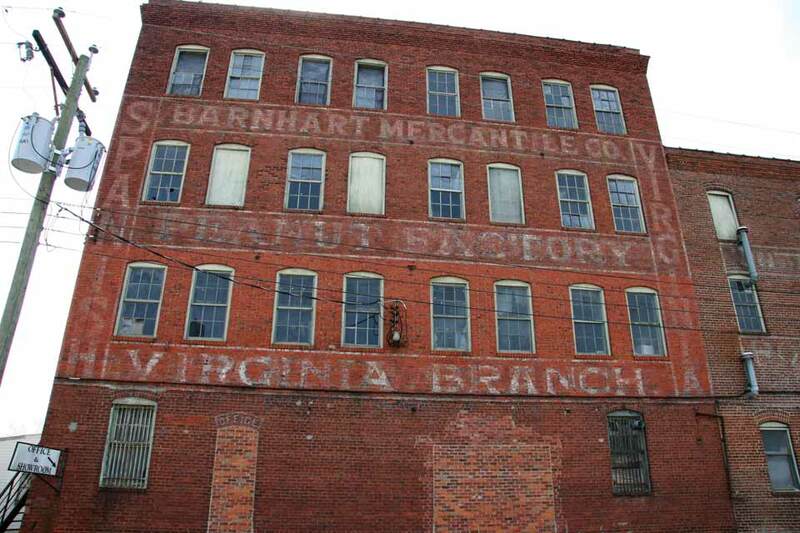 The Barnhart Mercantile Company was founded by him in 1883, and has won its way up the ladder to the position which it occupies today - one of the largest firms handling peanuts. They have large branch factories at Petersburg, Va., Denison, Texas, Valdosta, Ga., and New Orleans, La." Woodson Barnhart (1885-1957) was a son of William R. Barnhart, and he was assigned to the Petersburg branch of Barnhart Mercantile. In the mid-1910s he was listed in the Petersburg city directory as living at 208 N. Jefferson St., Petersburg. In this ad from 1920 he is identified as President of the company, while his father was Chairman. Another son who was an officer in this ad was William Randolph Barnhart, Jr., (1887-1956). He registered for the World War I draft in 1917 when he was "Managing Director, Virginia Branch, Barnhart Mercantile Co., Petersburg, Va." He lived at that time at Watson Court Apartments, Union St., Petersburg, Virginia. Manager at the Petersburg factory of Barnhart Mercantile listed in several city directories around 1917 to 1924 was Fabius Lee Minga (1862-1925). F. L. Minga was born in Isle of Wiight County, Virginia, 25 July 1862, and died in Richmond, Virginia, 26 August 1925. This ad from The Peanut Promoter, November, 1919, mentions the company's Virginia branch in Petersburg, Va. This ad from The Peanut Promoter, December, 1920, specifies that Barnhart Mercantile was established in 1875 and incorporated 1883.